Do you know where to order flowers for your lady this Valentine’s Day? It’s easy. Use any internet search engine, type flowers and the area you would like to find a supplier. 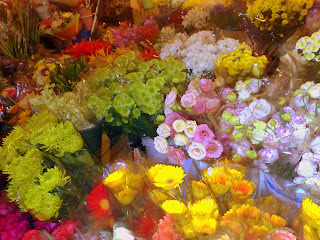 Say for example: Flowers to Cebu. There you will find online flower shops that offer to deliver flowers to your love any time of the day. But the price isn’t cheap. As I understand this business, prices quadruple a few days before Valentine’s Day. You can hardly find a bouquet that sells under P1,000. And if there are any, it is only about three stems of roses and a few add-ons. As I have posted here last year, my wife is into this flower business. We accept flower orders for all occasions. But mostly our customers are our friends and acquaintances since we have not really put our full focus on this one. Some even asked pictures. What I can provide now are those posted here under the label “Flowers”. No two bouquets are arranged similarly. If you want to send flowers to a special someone in Cebu, we would be glad to be of help. We are selling bouquets of a dozen roses and assorted flowers for P1,500 ($32)(updated December 2009), free delivery within Cebu and Mandaue cities. You can pay thru paypal or thru BPI bank deposit. Please email me at noverei[at]gmail.com for orders and inquiries. Please place your orders at least 72 hours before schedule of delivery. lhurey, it's the single-stemmed rose ang halinun sa campus.